Tshwane is South Africa’s capital city and the lens through which the African continent and the entire world see the country. Artiflex Engineering has a long standing history as an engineering system integrator in the region and has been involved in many wastewater and treatment plant upgrades over the last few years. One of the company’s achievements was to introduce PLC and scada standards based on the UAG/Unity PLC platform and other third-party scada systems. These involved tag naming convention designed according to the process flow of a wastewater treatment works. Also, device control blocks were developed designed to fit the third-party scada systems in a maintainable way. Tshwane metro as a public entity has the typical challenge of having multiple system integrators companies servicing them, which generates the obvious problem of standardisation. Not only are different engineers involved in the programming of the PLC and scada systems, but different plants attract different designs and therefore different standards. Also, different plants have different maintenance and management staff. Coupled with the involvement of different system integrators, this makes software management a mammoth task. During the upgrade of some of these plants, Artiflex found that various versions of the PLC and scada software existed. Changing the control systems for an addition to the plant, for instance, required a lot of time upfront before the upgrade project could be started. This not only resulted in pressure on the project but also cost to the client that could have been eliminated. When Artiflex got word of the PlantStruxure PES process automation solution provided by Schneider Electric, it was a logical step to investigate this solution for Tshwane. The company’s MD Johan Smith attended the launch of PES in Australia and it was immediately evident that this would be the ideal solution for Tshwane. Artiflex, supported by Herve Vandemeulebroucke from Schneider Electric, worked together to ensure the correct system architecture for the project. Subsequently, Artiflex Engineering became the first SI in the world to implement such a PES solution. * One integrated software for both PLC and scada. * Single entry into the control system. The PES server on site needs to be used to gain access to the control system software. The standards on this server need to be used. * One database running on site. This eliminates the problem where the same devices can have different control blocks for instance. * Integrated documentation. The integrated software allows for integrated document across the complete control system. The traditional problem of matching the scada with the PLC is eliminated. * Standards are known internationally. Any PLC/scada engineer familiar with PES can work on the system. The engineer is forced to use the standards of Tshwane. 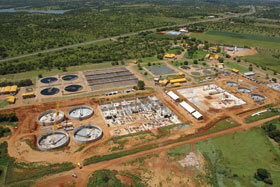 The project consists of 10 M340 PLCs, the phase where PES was implemented. These PLCs are linked to the control room via an Ethernet network supported by the Connexium range of switches from Schneider Electric. The scada currently consists of an engineering node, operation server and one control client currently linked to a small (maximum 3000 devices) licence. Although Artiflex has a full library of standards, it was ultimately decided to utilise the Schneider Electric water library to ensure standardisation with easy integration. 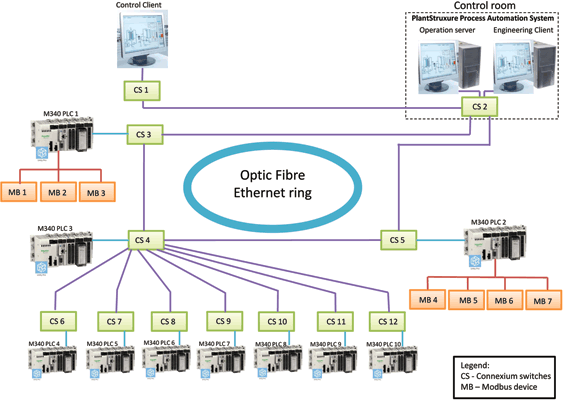 A PLC integrator only requires knowledge of the known Schneider Electric library in order to understand the client standards, but Artiflex is investigating the option of integrating some of its own standards into the Schneider Electric library. This project was designed with the rest of Tshwane’s plant in mind, a common standard across the entire Tshwane metro being the ultimate target.